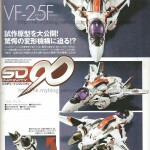 Gamu-toys has posted images of the recently released VF HI METAL VF-1S Strike Valkyrie. We’ve mirrored select images, showcasing the 1/100 VF-1S Strike Valkyrie in all 3 modes, with and without FAST packs+strike cannon. 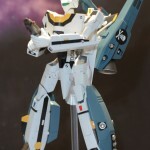 This highly articulated VF-1 is Tamashii‘s latest release in VF HI METAL lineup. More images after the jump! If you like what you see, head on over so site sponsor HobbyLink Japan to order yours today! This upcoming release in the VF HI METAL lineup is also available for preorder by site sponsor HobbyLink Japan. Hit the title bar to check it out! Shown in the beginning of Macross Do You Remember Love?, Hikaru’s VF-1A certainly left an impact, as it’s usually one of the 1st versions released of any given VF-1 model/toyline in Japan. If that wasn’t enough, a display of it can be seen atop Alto’s school in Macross Frontier, and Alto’s VF-25F bears the same colors! Hit the title bar to see more, courtesy of Hobby Stock & Amiblo! 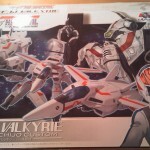 On display now at Tamashii Festival 2010 is the VF-1S Strike Valkyrie from the VF HI METAL line. The Do You Remember Love? version of the venerable VF-1S Valkyrie Roy Focker Special will be released in November, and this is the 1st time we have seen the toy outside of stock imagery. By final production, certain aspects of the figure may change, but for now, hit the title bar to check out images by Hobby Stock! It seemed inevitable that the VF-1S Roy Focker Special would join the VF HI METAL lineup one way or another. 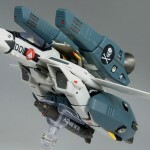 The upcoming version is from the popular Macross Do You Remember Love? movie. 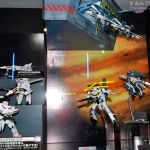 Could Hikaru’s Strike Valkyrie from the end of the movie be next, or could it be an upcoming Tamashii webshop exclusive? Alto’s Tornado Messiah debuted in the Macross Frontier movie. The 1/72 plamo line seemed dormant until the announcement of the Tornado Messiah. Discuss on the Toyark Forums› Views: 6586 › Credit: Matrix Soul of the Toyark Forums! 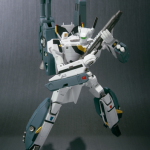 GA Graphic has posted images of the VF-19S Blazer Valkyrie from Tamashii‘s VF HI METAL line. 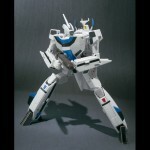 The Blazer Valkyrie was just released in Japan and is the 1st transformable toy made of the VF-19S in over a decade. 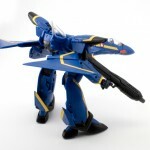 Being that this new release has many new parts, a VF-19F Excalibur won’t be a surprise entry in this line. Could it be the next Tamashii webshop exclusive? Also, earlier this year, Tamashii hinted at the YF-19. With a prototype already existing for the YF-21, perhaps the YF-19 and VF-11B Thunderbolt III are sure bets in the VF HI METAL line. That would complete the Macross Plus trio after all, and the VF-11B can easily be retooled into the VF-11C. 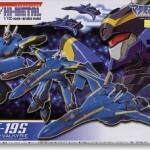 Hobby Search has posted all new images of the VF-19S Blazer Valkyrie in package from the VF HI METAL line! This is the 1st time that the package has been shown. This is also the 3rd release in the line, and the 1st transformable toy of the Blazer Valkyrie made in over a decade. The VF-19S is the squadron leader version of the VF-19 Excalibur. Optimized for use in space(but fairing pretty well in the atmosphere as well), the Blazer Valkyrie debuted in Macross 7, flown by Docker, leader of Emerald Force. It features 4 head lasers, commonly seen on “S” variants of variable fighters(VF-1, VF-17, VF-25), and is the most advanced Excalibur variant produced(for military service). Parts swapping for transformation has decreased less and less in the VF HI METAL line, as this toy does not need to swap as many parts for transformation as the VF-19 Kai Fire Valkyrie. Also, unlike the Fire Valkyrie, it comes with both a stand, landing gear to rest on(not exactly attach to) and missles for the legs. Those of you who preordered this item, or live in Asia should be seeing this toy very soon! Hit the title bar to see more! Though there are quite a bit of parts included, most of them aren’t actually necessary for transformation. The heat shield is the main one needed, everything else is predominantly for cosmetic changes. Hit the title bar to see more!